By now, most people in education know about Maker Spaces, but how can schools sustain and keep their programs successful? 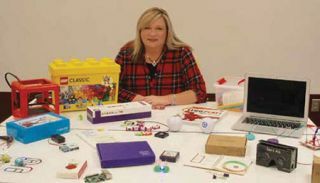 We chat with Michelle Cooper, director of the White Oak Middle School Maker Space, about the future of these STEM-heavy hotspots. How do schools or learning centers sustain a Maker Space? Students are pretty savvy inventors. The key is to continually challenge the students. To inspire innovation, I held a Great Maker Challenge. Student teams met during the month of April to invent chain reaction machines. The fun began as students brought their ideas to life. They constructed every aspect of the machines and were able to troubleshoot problems that arose. Once the machines were assembled, engineers Terrence Kelley and Jeremy Hayes from Norris Cylinder Company took time to visit with every team and offer advice. How can maker spaces stay current without blowing the bank? Michelle Cooper, director of the White Oak Middle School Maker Space Grants are a wonderful option to help implement maker spaces. Donors Choose has been a superb resource to help me fund our maker space. Many districts have educational foundations that provide grants directly to your school. Foundation members love to see the direct impact their funds have on student success. Keep reports, take lots of photos to share, invite the community to a maker showcase, and create a blog so that the school and greater community feel part of the experience and see the value in supporting it, financially and through offering their time and other resources. Recyclable materials are another cost-saving option. Students will gladly bring items to school that were destined for the trash bin. Teaching students to use what they have available teaches them resourcefulness. Physical space is a limitation, but don’t let it be an obstacle to students learning; get creative. With 180 students joining my tech club and a library capacity of 30-40 students, I took our school colors and started a maroon week and a white week tech club to rotate students. We allow any interested student to join, from struggling learners to gifted students. You don’t see behavior issues because they are so engaged. When you give these kids a problem to solve or something to create or invent, it reaches a different dynamic in the kids than in the classroom. What trends do you see evolving in this arena? I believe maker spaces will continue to be student-driven, with augmented reality and virtual reality having a powerful impact. Gamification will continue to rise as students can code their own games, create apps, 3D prototypes, and social programs, as well as explore virtual gaming worlds such as Minecraft and the new Swift Playground from Apple. The emphasis will be on creation and not consumption. Maker spaces will become a seamless part of our culture, a necessary and expected part of education, public libraries, and institutions of higher learning. What are your three best pieces of advice for educators embarking on their first Maker Space program? 1. Invite community members into your maker space to mentor students. Real-world connections inspire and motivate students to solve local, national, and global problems. 2. Use social media to your advantage. Let parents know what items are needed for your space. Parents are wonderful about donating items, such as Legos, when they clean out their children’s rooms. 3. Teach three life lessons within the space: Working together is about compromise. Failing is okay; giving up is not. Perseverance pays off.